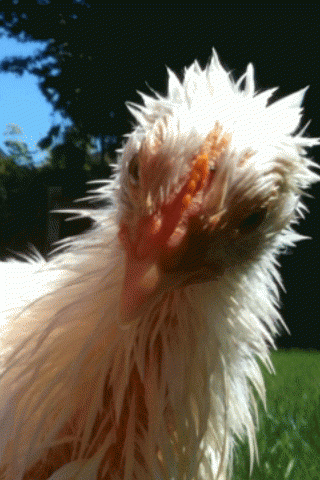 I'm a total chicken newbie and loving it. 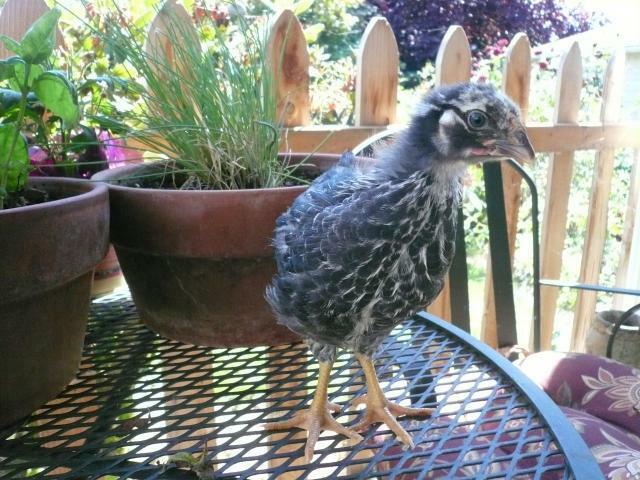 Planted a lavender labyrinth on the vineyard last year and when we went to pick up the lavender I discovered a little flock of chickens that actually let me hold them. I was hooked, and have been reading books and BYC ever since. 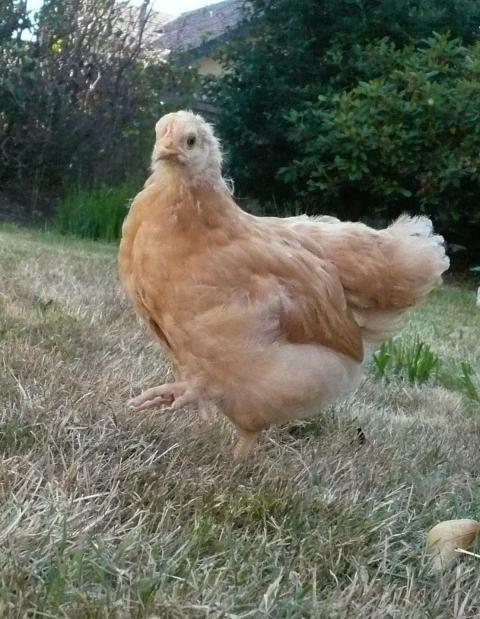 Lost my buff Silkie the day after she got here and I was pretty sure I wasn't cut out to have chickens, but now that I know these girls, I'm convinced I waited far too long! 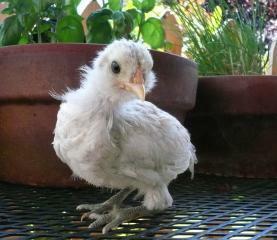 I'll be posting more chick pics as they grow. 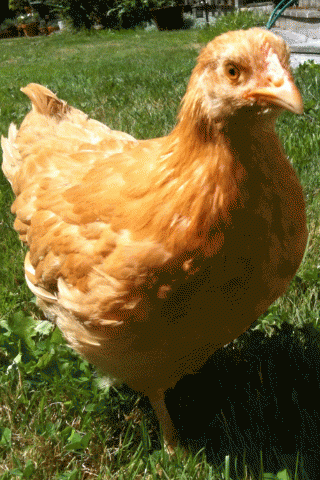 The coop page is going to be a work in progress. 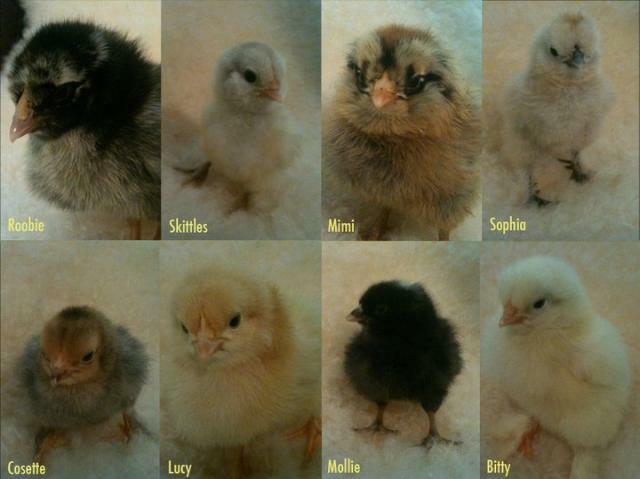 June 18, 2010 - The chicks are 4 days old here. 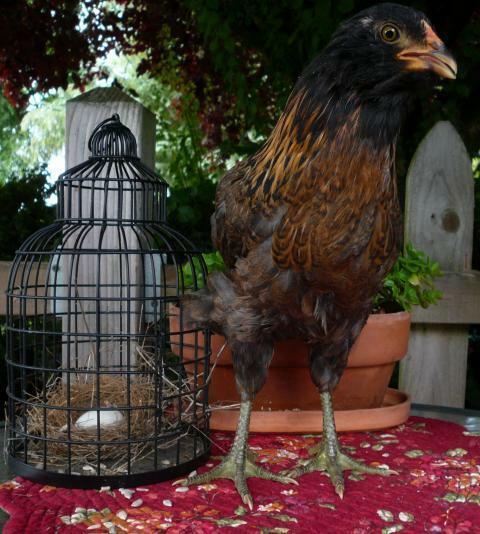 Skittles - Bantam Easter Egger (Her personality matches my Blue Heeler. Hyper, but loving, cuddly and devoted.) Her Michelangelo white marbling is now turning to dirty gray on her neck. 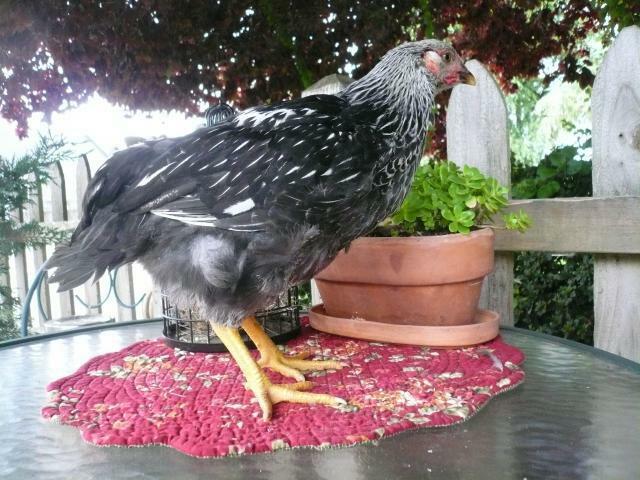 Will she lose that and grow some lighter feathers? Anybody know? Skittles the Easter Egger who looks and acts much like a PIGEON at 8 weeks old. 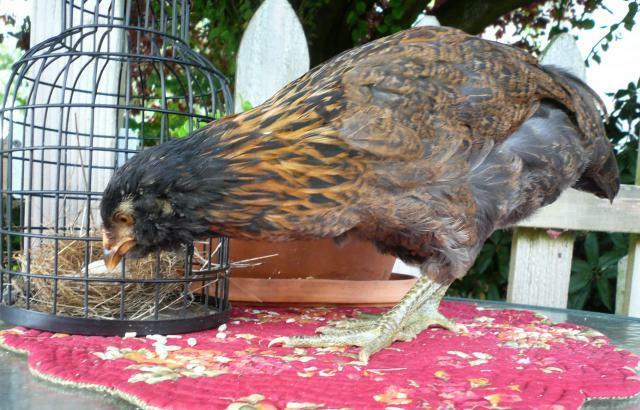 MiMi (The Mims) - Standard Easter Egger My daughter's favorite. She's been pampered. 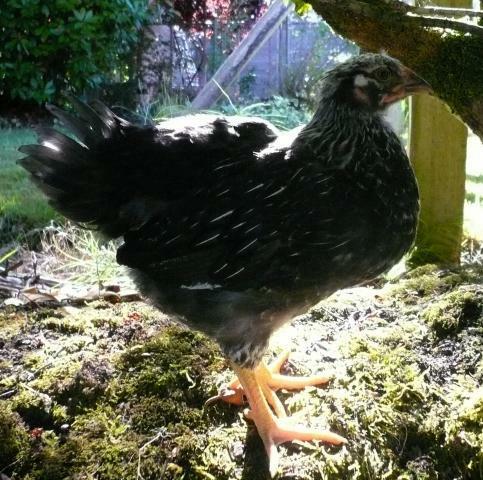 Got her feathers first and is turning into a beautiful girl. She coos. Lucy (Orpington) and The Mims getting snuggled. Three Days. The Mims at 8 weeks. I love the way her face filled in and the puffy cheeks got black and puffier! 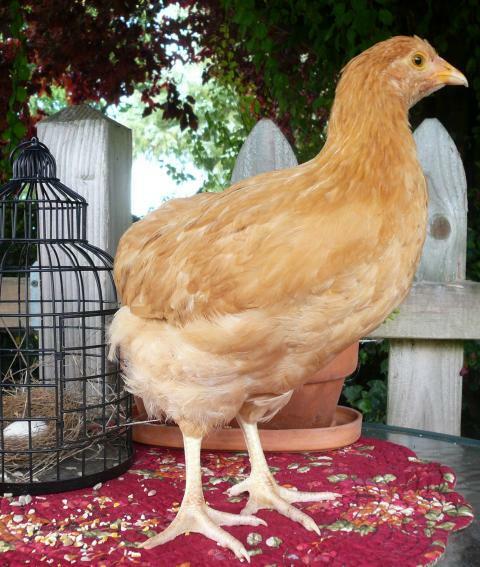 Lucy - Buff Orpington (Yes folks, yet another "Lucy")- She matches my Golden Retriever! 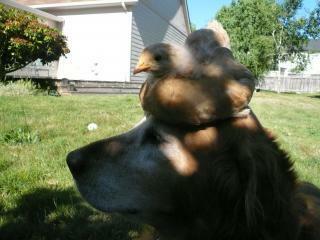 What a mellow chicken, and huggable too. Always heads for my lap and pushes anyone else off if at all possible. While the other girls eat scratch out of my hand, she needs to be IN my hand and is then racing towards my shoulder. Lucy loves her Dog Macey. 4 1/2 Weeks. 5 Weeks and growing, growing, growing. Lucette looks totally rumpless in the above pictures! 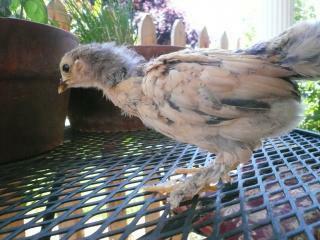 I had to go check her today to make sure there were no tail feathers gone, but she's fine. You can see them in these pics! 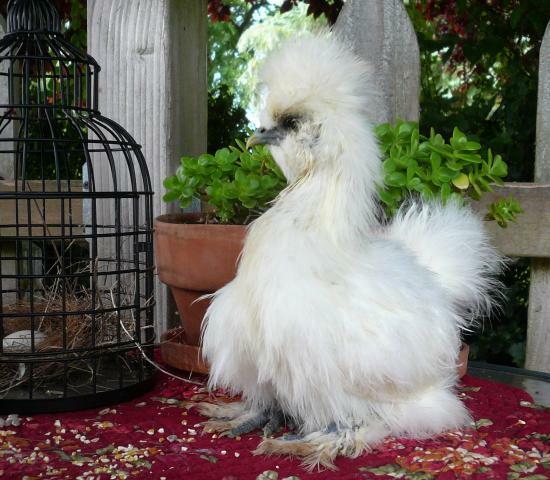 Miss Sophia - White Silkie Timid and precise, takes her awhile to be one of the crowd, but she eventually joins in. Nice to have her hang with me for awhile though. I should have had her pic in here for 5 weeks so you can see how homely and gawky she got. I mean, even worse than at 3 1/2 and so silly. She is such a funny little girl. She still has a bald breast bone which looks so bad because of her black skin. 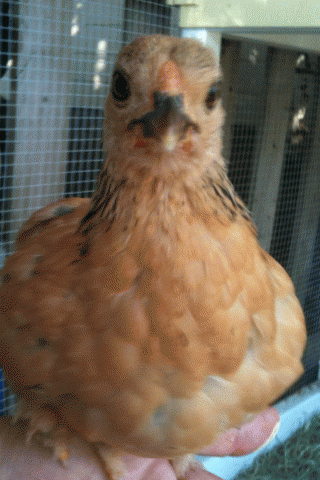 Her beady little eyes are starting to disappear under the crown, but it still looks a bit like a back-comb. She's a timid little thing, not exactly soft to pet, but hard not to pick up and at least try! The Miss Sophia at 8 weeks. 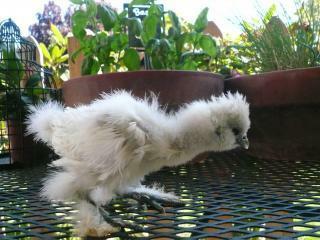 Poor little thing needs some feathers, but she is usually the furthest away from the heat lamp! She must have some awesome inner heater. 5 Weeks. Look! Feathers!! Now for her neck and bottom. Zoe at 8 weeks. 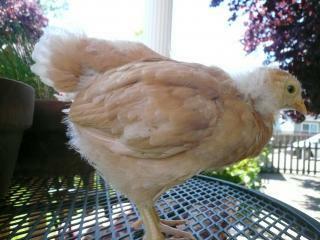 She finally has feathers on her neck, but doesn't seem to have a cape. She has this nice full body but her neck looks long and lanky. I don't know...will she fill out? 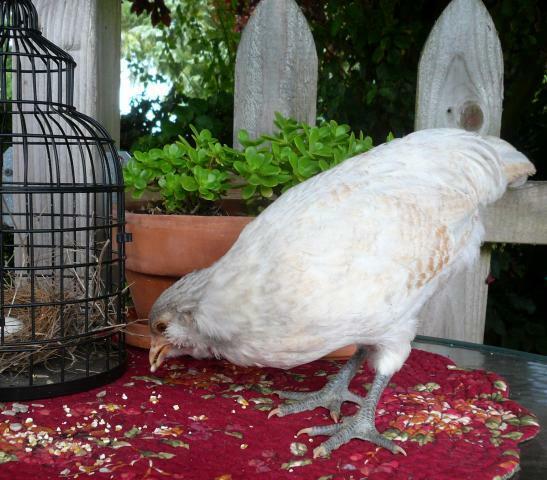 Zoe has proven to be about the gutsiest little bird I have. First to check out strange things to eat or hop on. She also sits off to herself a bit more than the others. Kind of a silent majority all by herself. She'll jump on my lap until others follow her and then she doesn't like to share so much. 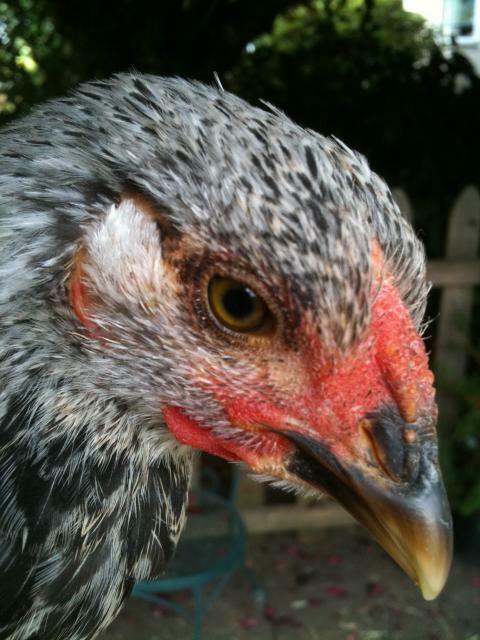 Cosette - Bantam Buff Brahma Have to push this girl out of my lap sometimes. She believes she is a lap dog. I love her coloring. She and Lucy (the BO) are my Golden Girls. 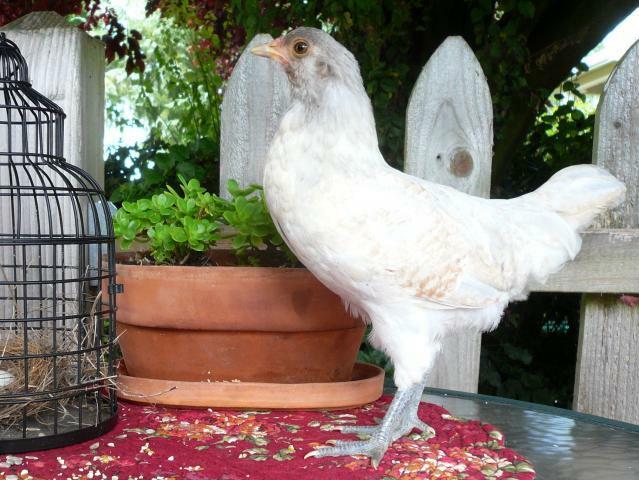 Miss Bitty Princess Buttercup White - White Cochin A demure little princess in her own right. Buttercup and her duck. Four Days. 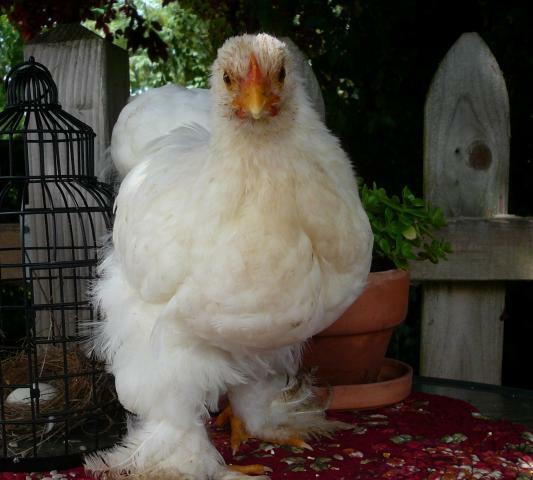 She is having a hard time walking up the ramp into her new coop with those bedroom slippers! I watched tonight and she gave it a couple of shots walking. It took her almost 20 minutes pacing back and forth until she finally just flew almost all the way up! Where there's a will, there's a way. Buttercup at 8 weeks old. She totally needs a BATH in this picture because she was getting too dirty in their smaller quarters. Also, her face is a mess because she gets covered when she eats watermelon! 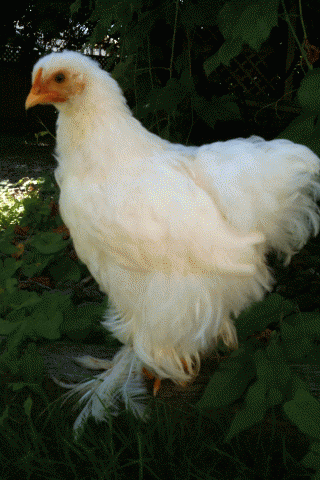 Look at her beautiful white feathers. What a little pigpen. Waiting for a warmer sunny day before I do that. I'm sure she won't be much happier then, than the way she looks in this picture! If looks could kill, eh? Sunny day today so she got a little foot, face and chest wash. 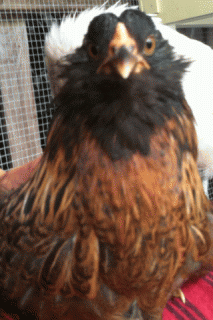 Here is a little wet cochin looking silly! And 20 minutes later, she's almost completely dry and white again. 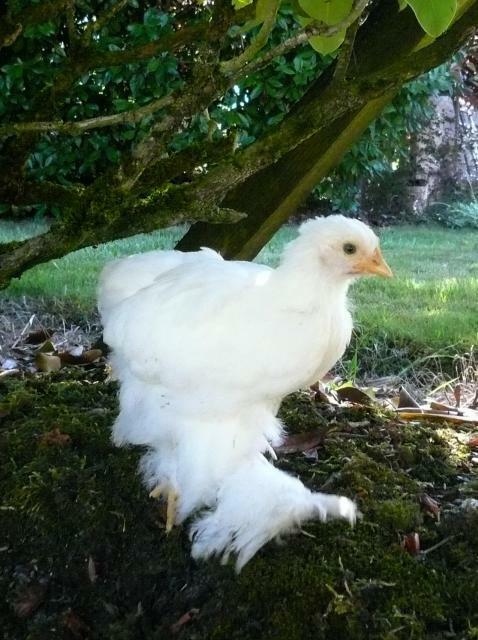 Those bedroom slippers take a while to get fluffy again! 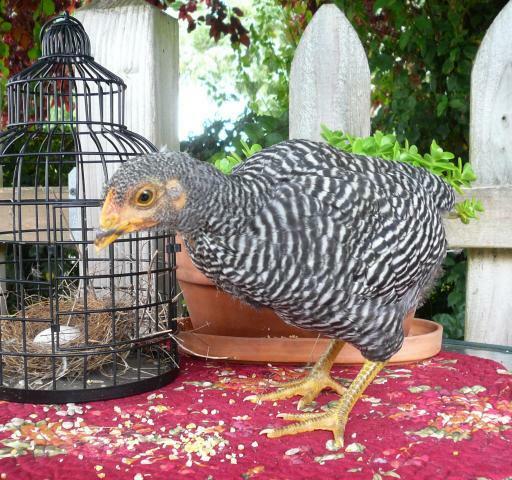 Roobie, Silver Laced Wyandotte - This girl is a real toughie. I wonder if she might be a Roo? Hence the name ROObie, just in case. 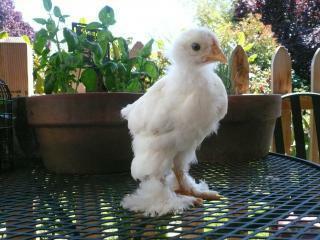 3 1/2 Weeks - I can't wait to see this girl feathered out! Ah, the Roobie. 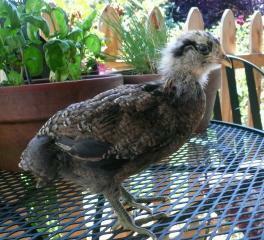 Still hoping that she is not a rooster because she will have to go. Any new guesses? She's 8 weeks now. Very very elusive this one is. Today though, I "forced" her to sit in my lap for a bit. Then I let her go, and she wouldn't leave. 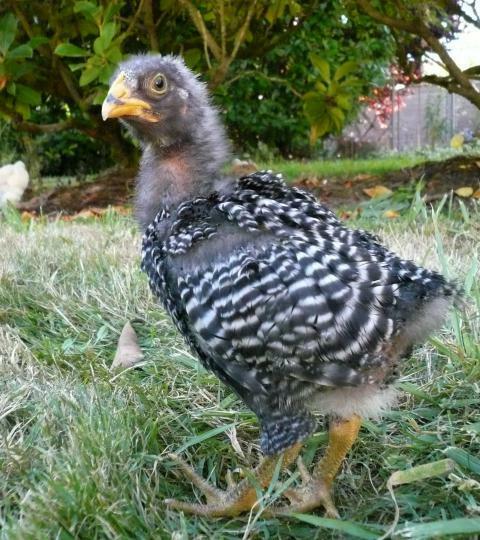 Makes me want to keep her even more but we live in the city limits for now (across the street from the county) and there are no roosters allowed. My favorite picture of Roobs. 8 weeks. To be continued...maybe at 12 weeks!? 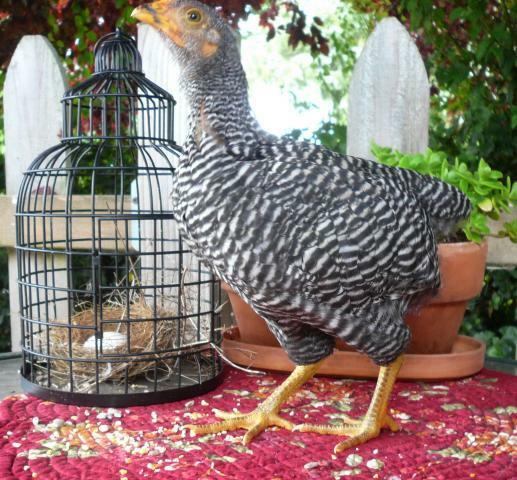 I bought her two friends, Dakota and Bella, English Orpingtons. They are beautiful at 3 months old now and the three girls are inseparable. 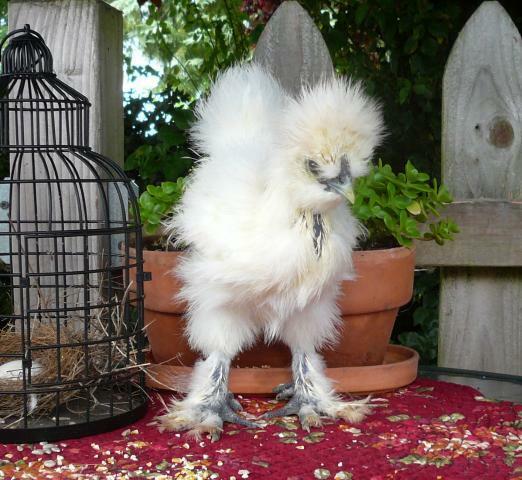 Bought a beautiful little Silkie rooster at 8 1/2 months. He's 10 now and finally crowed! He's starting to feel at home and not so frightened of the Golden Girls any more. 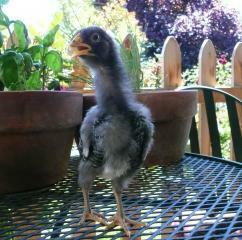 I got a replacement from MPC of 7 chicks, but 3 were dead. One on arrival, one two days later and one 3 days later. 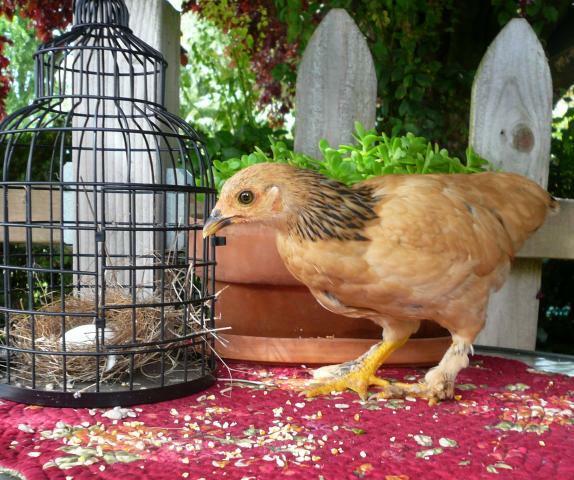 I was pretty much tired of handling dead chicks. So sad. Off to the feed store I went and got three Rhode Island Reds one day and then back for two Easter Eggers two days later. Had an issue with Little Red Broken Baby (Libby) when I realized her legs were not working right. Splayed or twisted tendons? 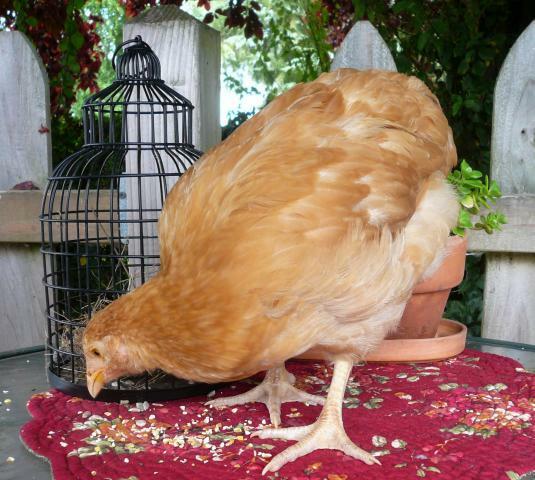 With help from this forum, I was able to help her get her feet under her and although she has many many extra little toes, walks like a little duck, looks like a dumpling, she is strong and healthy now. So I'm up to 18 chickens in Chicken City. 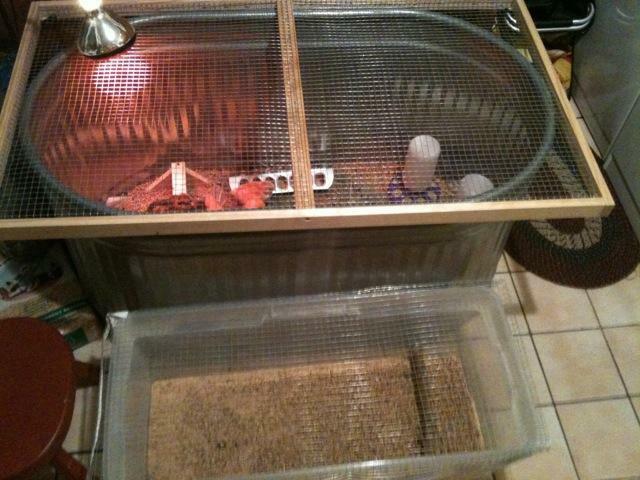 Built a second coop, separated the pen, and now have 3 separate sections for all the different ages. Whew. I will be happy when they all can learn to live together! Oh Whillo! You're babies are just GORGEOUS! That picture of Lucy sitting on Macey is just SO adorable!! 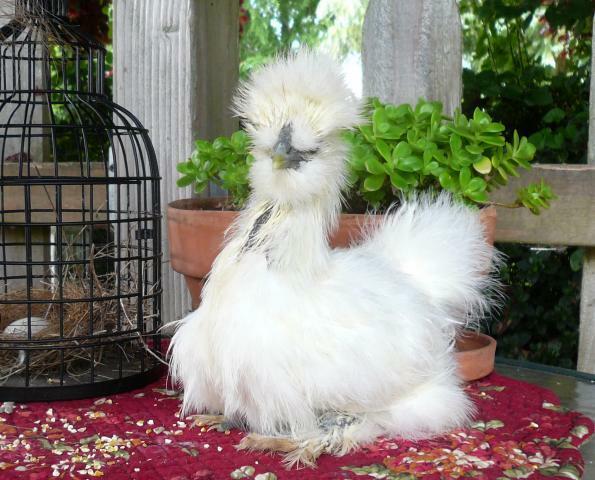 Where did you get all your chicks from?